OK, so you’ve gotten your LinkedIn profile in tip-top shape (if not, click here for tips on how to do this), and you’ve been busily searching and clicking to connect with the very people who need the service you provide (if you missed the article on how to do that, here it is). Now it’s time to start building those oh-so-important client relationships. Because it’s not about booking that one gig, it’s about becoming the go-to for that client’s voiceover needs. The first thing to do before sending a message to your new client is to put yourself in the right mindset. You are not peddling cookies to a diabetic here, you are a professional who provides a great service that this person uses on a regular basis. Sidenote: if what you have to offer is not great and you know it, you need to get your act together before you go another step. If you need more training or 1-on-1 coaching, check out Introduction To Voiceover with Rhonda Phillips. If you’re not sure if your studio is up to snuff, look up audio expert Dan Lenard at Home Voiceover Studio. Just remember that by reaching out, you are not bugging anybody, you’re doing them a favor by saving them the time and energy of finding someone to meet their particular business need—YOU! Thank them for choosing to connect with you. They didn’t have to do this, and yet they took time to click the“accept” button next to your name and photo. In order to live a life of gratefulness, I believe in thanking those around me without groveling. Acknowledge even the little things. Use your own words for how you’d like to phrase this. Offer a sincere compliment. A good relationship begins by taking interest someone else. Even if you’re a non-religious person, this Bible verse from Philippians 2:4 has a great message for anyone in the business world: “Let each of you look not only to his own interests, but also to the interests of others.” Here’s your opportunity to make a personal connection, so don’t blow it! Find something about their picture (non-creepy), where they live, what school they went to, something you noticed in their summary or job experience, or part of their body of work that speaks to you, this is the type of thing you can talk about with them that will start the ball rolling on a beautiful business relationship. Just like a first date, you gotta make small talk, not go straight to the conversation about how many kids you want. If you really don’t see anything you can connect with on their LinkedIn profile, look under the “Contact Info” tab (to the bottom right of their name/position, underneath the number of connections they have) and go to their website. Check out their portfolio and find something to connect with. If they don’t have their website listed, you can try Googling it or go to their Twitter or Facebook page, and while you’re there, follow them. You’ll see in a moment why that’s important too. Ask a question if appropriate. Not only does asking a question elicit an implied response, but it again shows an interest in what’s going on in their world. Tell them a bit about what you do and how you could help. You can briefly mention in 1-2 sentences information about your studio, specialties and/or clients. Keep it as brief as possible. Resist the urge to share your life story! Don’t ask them to listen to your demo, buy your product, or check out your website. Keep it casual and play it cool. They can tell what you do and they know that by reaching out to them, you want them to hire you. So you don’t need to say it. Find your own phrases that fit your style, but maybe say something about how you would love to collaborate or work together or join forces or whatever sounds like you. Because their company is awesome and it would be an honor/pleasure to be considered, not because of your own awesomeness. Remember that your goal is to bring THEM success! Offer to answer any questions. That shows you’re willing and available to communicate with them. And you need to be responsive and timely when you do hear from a potential client. Wish them the best! Find your own trademark well wishes, even if it’s just “Have a great day”. Sign off. Yup, it’s time to stop talking now. You’ve said all you need to say and done all that you can do. No more words need to be exchanged. Say goodbye and end the conversation. Leave your contact info. I do not mean ALL your contact info, including cell#, Skype ID, Twitter handle, Facebook page link, and all that. Just your website and email addresses will suffice, gently placed right underneath your name as you close the message. They can find all the rest on your LinkedIn profile if they want it, but these two bits of contact information are what you want them to save and use to contact you directly in the future, so put them out underneath your name and leave it at that. No shouting “Look at my stuff!” or “Can’t wait to hear from you!”, just a calm reminder that you’re here to help anytime. Which is exactly what I say whenever someone contacts me to say they’ll put me on their roster or they’ll let me know when they need voiceover talent. I’m here to humbly be of service to them whenever it is that they need me. DO NOT start listing all kinds of information about yourself. The ideal first messages should stay within 50-125 words, so if you start talking about your stellar recording studio or tell them all about your past clients, not only will you start making it all about you, but you’ll blow the 125 word limit REALLY fast! Know what that gets you? Crickets, not clients. Nobody wants to work with a horn-tooter. You’ll have time later to tell them the intricate details of your past work, but for now, keep the attention focused on your potential client. Pick a goal number of how many NEW people you want to reach out to on LinkedIn per day, and stay accountable to that number. What gets even more results is having an accountability partner who will lovingly hold your feet to the fire to keep you focused and thriving. Follow them on whatever social media platforms you can find. That way you can connect again on an article they wrote, a video they published, or a photo they shared. Keep reaching out in small ways so that you stay in their sight line and they will think of you next time they need the service you provide. Pay attention to what your contacts are doing specifically on LinkedIn. Did they get a promotion? Write an article? Have a work anniversary? Take a moment to reach out with a little note to say congrats. Check your LinkedIn notifications tab to check out updates, and read your newsfeed showing what your contacts “liked”, published or commented on so that you can stay connected. Save talking points to trigger their memory of who you are. I keep track of comments I exchange with a new connection that will help us remember each other. These are real people with real feelings and real lives apart from their ability to hire you. Treasure the knowledge that they shared some detail about their personal life with you and respect that vulnerability as another human being. Record comments in whatever your preferred Customer Relationship Management (CRM) tool may be. Decide how often to reach out to your potential client and then do it! Your CRM can help with this when you set a quick reminder to follow up with this person every week, month, quarter, or year. Without a plan, we all know that valuable follow-up probably won’t happen as effectively as it should, which means missed opportunities and lost revenue. Has this LinkedIn series been helpful for you? I would LOVE to hear any stories about how putting this series of tips into practice for your business has propelled you forward and gained you new clients. If you have any tips or tweaks of your own to add, please share them in the comments below and we’ll all grow together! 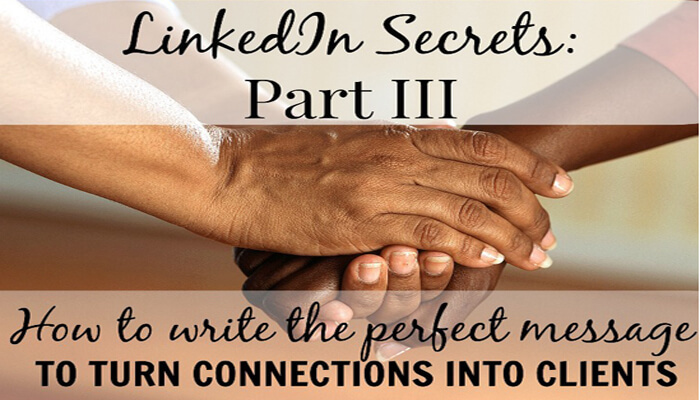 Secrets for Using LinkedIn to Attract Clients and Make You Money! One of the first pieces of advice I got from a successful entrepreneur specializing in social media marketing was to join LinkedIn. I really had no clue why I should hop on board yet another social media train at the time, but I did it. I took a selfie, loaded up some info about my professional life (such as it was), typed up a quick bio and that was that. Cross another thing off the list. I truly did nothing with said profile until late 2015. I had dabbled in cold calls, pay-to-plays, and was up to my ears in emails, lists and dead ends. All in all, I was flat out discouraged and marketing had become no fun at all. Then one day, I got bored and started clicking through some of my LinkedIn contacts. Mostly other voice actors, a few friends, and that was about it. I suddenly noticed that there was a drop-down menu to the side of the search box and decided to see what my options might be. Lo and behold, the word “people” caught my eye. I like people and they are a lot more interesting than email addresses. The more I played around with the many features of LinkedIn, I slowly realized that this could be my new favorite social media platform, as well as a window of opportunity. 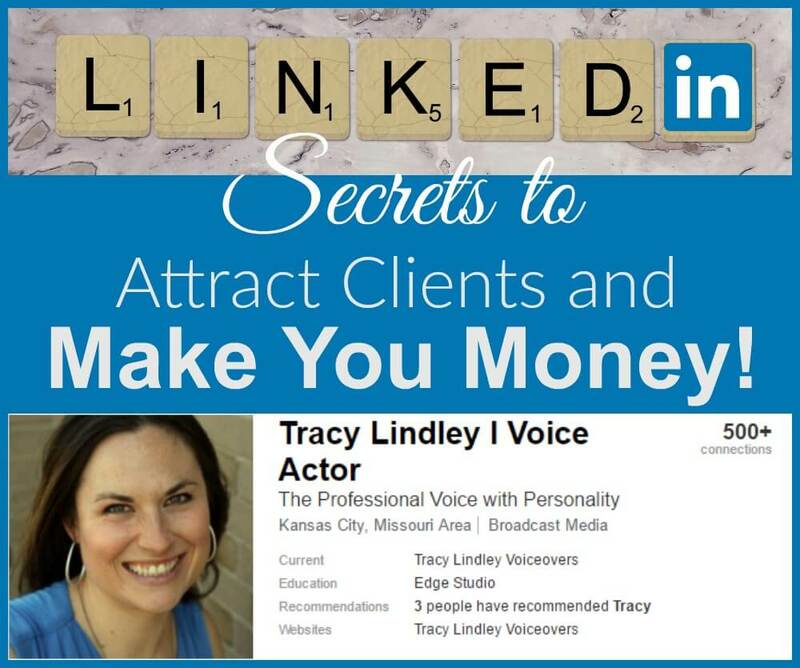 I seem to learn something new every day about this powerful platform, but here is the first of the LinkedIn secrets that I use daily to not only meet the right people, but gain new clients, book voiceover jobs, and develop mutually beneficial business relationships. Your LinkedIn profile needs to be a professional, informative, and accurate representative of who you are. Selfies aren’t going to cut it if you want to be a true professional. Neither is a boring list of your previous positions. Speaking from someone who made those mistakes, save yourself the trouble and do it right the first time. I have four young children and a fabulous husband and I love them all to pieces, but I’m not going to post a family picture as my LinkedIn profile picture. Or a picture of me lifting weights in the gym. Or holding a freshly-baked chocolate cake. Those snapshots encompass moments of my life, but they have nothing to do with me as a voice actor and therefore have no place on my LinkedIn profile because this is the one blessed place where we keep it professional. According to LinkedIn stats from February 2016, a high-quality photo on your profile gets 14 times the views. So hire a photographer and go have some fun on a photo shoot that’s all about you! I did it and it was totally fun! I even used a bunch of the pictures from the shoot to put together a video slideshow showcasing a couple of my voiceover demos. Which I then posted on my YouTube channel and linked to my LinkedIn profile. Because I believe in getting my money’s worth. Even though a picture is worth a thousand words, people need a little more information in order to want to work with you. And that means writing up a little something to tell them who you are, what you do, and what you have to offer in the way of experience and qualifications. Some people like to keep it pretty formal in their writing style, while others take a more casual attitude with the copy. You have to do what fits you and applies to your profession. If you’re not a great copy writer, hire someone to help do that as well. You can also pick up helpful writing tips from others in your by visiting their profiles. Just be sure to never steal their copy. It’ll make both of you look bad. It’s helpful to include your title beside your name if you’ve got the room, because people can see that even before they click on your profile. We are all busy and attention spans are shorter than ever these days, so make it easy to spot as much about yourself at a glance. Which is also why you should also keep your summary section brief, about 3-5 short paragraphs, so choosing your words carefully is important. Keep it short, but define yourself clearly through the lens of your potential client: what your values are, what makes you unique, what types of projects you specialize in, and most importantly, how you can help them. To add to your credibility, list several of your top clients in bullet form, and if you like, your talent agencies. Since my home studio is such an important part of what I do, I also include a photo of it. Accuracy means not only telling the truth, but painting an honest picture of yourself in the best possible light. Maybe you’re not that experienced, but you can still highlight your strengths and whatever past work you have done. Never lie about having worked with a particular client in the past or held a certain position, or anything else that isn’t truthful. Ethics matter in maintaining a successful business. That being said, an accurate portrayal of yourself means taking an assessment of who you are in all your unique glory. Are you analytical and detail-oriented? Are you fun and light-hearted? Remember what your high school Language Arts teacher talked about regarding your writing “voice”? Your written “voice” needs to come through in your profile to add that touch of personality and humanity, the sparkle that makes you YOU. With 414 million users on LinkedIn at the time of this post, your profile needs to stand out to be noticed. There’s so much more to say, and if you’d like more information, there’s an entire course covering every detail of how to build a healthy client base using the free version of LinkedIn. It’s got 2 hours worth of videos teaching you exactly how to use LinkedIn to rock your world! Check out more about The LinkedIn Edge course right here! In the second part of my super-secret LinkedIn series, I’ll spill my step-by-step method on what I do to find new clients and turn my profile into profit. Read part 2 in the series right here!